"Commuters working at the Sales Tax office in Mazgaon and other people heading to Mazgaon have been facing difficulties. Some have even died crossing the rail tracks in the absence of an FOB,” said Abasaheb Deshmukh, who runs a bookstall at the Sandhurst Road station entrance. Barely two kms from Elphinstone Road, Currey Road station on the central line also witnessed a similar rush on Friday. With commuters taking shelter from the rain, a huge crowd had gathered at the station’s exit. Averting a possible accident, the station staff allowed some women to wait at the booking office. “With incoming trains bringing in more crowd and nobody exiting the station, there was a complete chaos. There was a pregnant woman in the crowd and she was feeling uneasy. So, we made her and other women sit inside,” said a station staff member. With only one FOB for the entire station, at the northern end, it becomes the sole entry and exit point. According to station staff, it is an absolute nightmare for commuters to exit or enter the station during rush hours. “During peak hours, if trains from both Churchgate and Virar side come at the same time, commuters take five to 10 minutes to leave the station. The queue extends all the way to the other end of the station and during this time, there is hardly any space for commuters to enter,” said Suresh Desai, a bookstall vendor at the station. Constructed in 1920s, the ramp of the FOB ends at the station’s sole ticket counter. This means, commuters exiting or entering the station have to battle for space with those who queue up to buy tickets. “If even 15 people stand in the queue, it blocks the station exit. The only saving grace is that unlike the staircase at Elphinstone station, it has a ramp. There are less chances of people falling or tripping here,” said a station staff member. The railways is in the process of constructing another FOB at the southern end of the station. Work started in October last year and according to railway officials, it is expected to be completed in a month or two. The FOB will lead to the monorail station of the upcoming Phase II line, from Wadala to Sant Gadge Maharaj Chowk. For commuters, the battle for space continues onto the footpath outside the railway station. The narrow footpath barely allows two persons to walk at a time. “During rush hours, people are bumping into each other while walking on the footpath. Just one person has to stop in his path and chaos descends here,” says a hawker who sits on the footpath. Images of the stampede on the FOB at Elphinstone Road station disturbed many commuters who take a bridge on platform 7-8 at Kurla that also sees a huge commuter rush. While there have been new bridges on the platform, the second bridge from the CST end at Kurla continues to be crowded with people as trains pull in. Complaints of women being groped and mobiles phones being stolen are common. 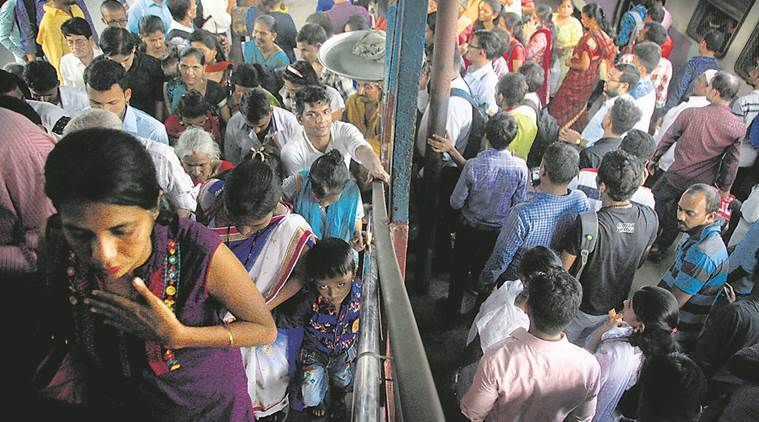 Overcrowding is nothing new in Mumbai rail stations and so has been rain. So wondering what caused this tragedy. Did someone shriek or was there any rumour? Every place in India .. this is waiting to happen. You can't fix one bridge, you have to fix them all. Apparently, Modi govt is screwing up big time on railway ticket rates, which are now costlier than flights in some cases. I never traveled first class in Indian railways, but even so the tickets of second class AC are now costlier due to the early purchase cheaper policy.